If you are looking for a clean, comfortable, well designed and friendly place to stay, Onederz Hostel Siem Reap would be the best choice. 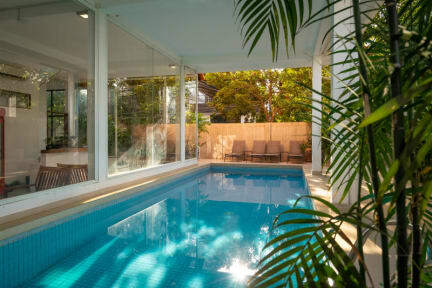 It is a premium hostel with swimming pool located next to Angkor Night Market, and also 4 minutes walk from Pub Street. At the hostel, you can meet friends from all over the world at our large common area including swimming pool, enjoy free internet and Wi-Fi access anywhere in the hostel, or relax in our cozy TV room. Our friendly staff will be more than happy to provide you with information about the city. 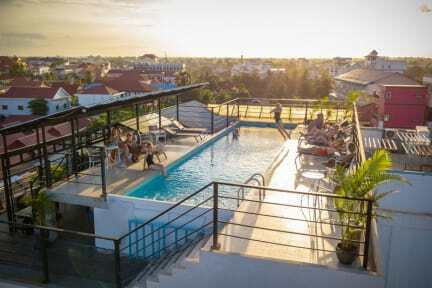 Onederz Hostel Siem Reap is our second hostel in Siem Reap and our fourth hostel in Cambodia. We also have hostels in Sihanoukville and Phnom Penh. 1. Check in from 14:00 and check out before 12:00 noon. (1) We strictly require a passport at check-in. (2) Late check-outs will be charged for an additional night. 2. Payment is due upon arrival by cash only, please. 3. Cancellation policy: At least 1 day advance notice before the arrival date is required. 4. Room rates do not include breakfast. Good position, private room clean and nice. Estremamente pulito, è frequentato sia da molti giovani che da viaggiatori di tutte le età. Rapporto qualità prezzo eccellente. Molto bella la piscina sul tetto. Personale disponibile e ottima la comunicazione in lingua inglese. The best Hostel I've ever been. Amazing staff, helpful that work with passion (this is an important detail). The hostel is really clean, in a good position and it's offer good services as excursion with competitive prices and good food (cheaper and at the level of local restaurants). I really advice everybody to go there if you're looking for an accomodation in siem reap. Great hostel just next to Night market and 5 min walking to Pub Street. We had a private double room, extremely clean and comfortable. Staff was helpful and kind, they waited for us at the airport even though we couldn’t inform them about our delay of more than one hour! Nice place highly recommended! Amazing hostel. Great position next to the night market and closed to the center, but in a quiet street. Good restaurant that provides smoothies, breakfast and some local dishes, very cheap. Nice staff (some speak a very poor English and it's not easy to communicate). Very ckean. Great experience! Great hostel, staff were awesome always helpful and spoke very good english,lacks a bit of social life so I recommend it for groups or travelers who just want to relax. Amazing pool on the rooftop with views of the town. I’ll definitely stay there again! It was great to stay in this hostel,wat make the diference is the personal, no one complain about thr structure, thanks to all staff. A great, high-functioning hostel! You could literally live inside the entire time and everything would be provided to you:food, snacks, drinks, tv, music. They organize multiple tours (not super cheap for Cambodia but ok prices) for Angkor Wat, the floating villages, etc. Right in front of the night market so super central. Comfortable, (very) western atmosphere. Please please please get courtains for the beds! The hostel is nice, well located and very big. Staff is smiling, professional and available. However, if you are looking for a cozy or social atmosphere I could not really find it here, but maybe it is just because I was here for one night. One suggestion: change lighting in the building, especially the common room. It is very very cold and uncomfy.